Hey--I have the same problem with a GD tuner on my J-45. Looking forward to see if you can get it fixed in your next post! I've realised the same thing after a whole long story. Now I've got a replacement tuner, but I don't know what size push-in bushing fits the deluxe tuner hole. Can't find clear info on this. It helps a lot. I think the previous ones were to convert from Grover holes to vintage tuners. They were slightly too big for the deluxe holes. 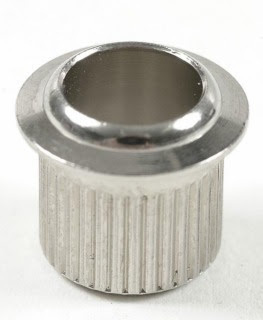 But these conversion bushings should do the trick to go from 80's style screw-in bushing deluxe tuners to vintage style push in bushings right? Tell you what.... 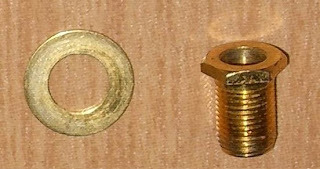 I happen to have a set of those conversion bushings that I'm going to use for another project. I'll do a sizing test on my Les Paul and get back to you. Brilliant. Thanks for that. I'm going to order a set of those. I am about to purchase a set of Grover deluxe waffle backs to fit to my J45 and I will keep the originals in a bag in case I even sell. I'm more interested in how the thing plays and behaves than I am in re-sale value.The machine heads fitted to my J45 historic series are Kluson and they are hopeless. New non Gibson quality tuners will suit me fine. I tried to post a comment earlier but it would not let me so I apologize if this duplicates. The problem is you comment that the cover is only held on by an interferences fit of the two tabs. That is not correct. You must remove the entire tuner from the headstock. Insert the two tabs and the cover. The tabs are then "staked" on by flipping the tuner over and hitting the tab ends where they come through flush on the reverse side. Stake them with a small chisel or screwdriver. 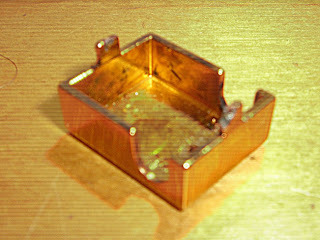 Look closely at the tab ends where they come through and you will see where this was done previously at the factory. (Please look) If you just insert them and hope they will stay on with an "interference fit" you will be disappointed. They will fall back off. They will fall off as they did before, and again-- as gravity is not just a good idea it is a law. If however you do this correctly the cover will stay on if you do not hit them against something hard which should be avoided with an expensive guitar like a Gibson. All kidding aside let me know if you have any trouble. I do a lot of work on old Gibsons in Florida where Skynyrd was king and this usually works as it is how they are assembled at the factory---one of your tabs appears to be partially broken so I have had to have a jeweler friend braze on a couple occasions--still cheaper than a new set of tuners. You are, of course, completely correct. I did post a comment at the end of part 3 regarding the stake trick, but I should really write a new updated post, as I've heard this same thing from several sources since this post was originally written. Thanks for the reminder. I repair guitars and have seen plenty Fenders etc with vintage style tuners that have bent key shafts from impacts and the casing is still holding on solidly. I have a Gibson SG in the workshop at the mo with one of the tuner casings clean off - not a mark on any part of the tuning key and the shaft is perfectly straight. 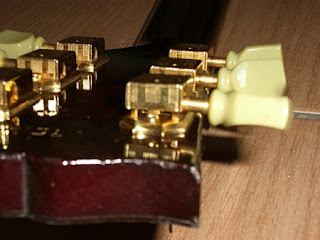 I had a slightly different problem with one of my machine heads on my 2002 Gibson LP Studio. The capstan of the G string machine head would actually rotate counter-clockwise by maybe a 10th of a turn. Just enough to constantly go out of tune with really any attack whatsoever. I was skeptical about replacing the tuners because of the obvious devaluing...but... the Planet Wave Auto Trim locking tuners in the 3+3 set actually line up with the pre-drilled holes for the GD machine heads. There is only one screw to hold them on, and you can see the second hole where there is no screw, however... they lock, and my LP stays in tune now. 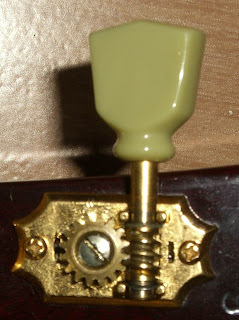 Plus they have black capstans, and just look kind of cool against the black headstock. I of course retained the original tuners for value purposes, but I could literally grasp the capstan with my thumb and index finger and rotate it backward slightly without much twisting pressure. Not going to cut it. I removed the back of the tuner after reading this post and tried to tighten the screw, and had trouble getting the cover back on. After reading the post about smaking it to set the tabs (mine only has one tab) I will smack it when I get back home, and put it back in the zip-lock bag with the others in case I ever sell the LP, but I don't think I will. All this to say, the Planet Waves Auto trim set will fit right in, work like a charm, and you don't have to drill holes in your headstock. They were about 60 US$. Worth it, it was like getting a new guitar. Many people think you should pull the string taught through the eyelet before tightening... dont. You can wrap the string around the post just like any other tuner. Leave about 2 inches of slack on the string before tightening the lock screw on the bottom. That will lock the string, and you can wrap the excess around the post. It will still trim the string for you. If you pull the sting taught, lock it, then tighten it, it will give a very loose action, and there aren't enough wraps to function the way it was designed to function. I've never had any problems with these, I have them on my 05 Strat Deluxe, and my 06 Tele deluxe, and now my LP. Just thought I should post this after reading some comments on reviews of the tuners posted by people who made the above mentioned mistake. One advantage to the flimsy mounting of the winding shaft allows it to easily pop apart if the tuner should strike against something. Easier to manage than sustaining unrepairable damage (and having to buy SIX new tuners). Nice job of explaining the mechanism which all guitarists should learn about before they change their tuners in anger. Someone somewhere incorrectly says he thinks the Gibson Deluxe Tuners are made by Schaller. NO WAY ARE THEY MADE BY SCHALLER. I have Schallers on my ES135 and they are night and day, they look similar, but they're NOT the same. Thanks for your comment. I've edited the post accordingly. Agree completely about quality issues. Replaced my Custom Shop ES 339 Gibson branded Klusons with Grovers almost immediately as they would not even keep the guitar in tune. Grovers are fine. My tech warned about the inferior construction of the originals. If your guitar tuners were not defective right from the start they will give you many years of flawless operation. The points you are making are all based on the fact that something was not right therefore it led to more problems down the road. Well, this is true with ANYTHING on the face of this earth that was designed, engineered and manufactured to be and perform a certain way but something in the chain of its components either failed or was tampered with during operation. Long story short, it is not the Deluxe Tuners the problem but they way they were used. If by any chance you received a defective instrument from the get-go, (very unlikely for Gibson) you should have been able to identify it immediately and have it fixed under warranty or get a replacement. Before you blame things on others, first do a self assessment. Hi, Anonymous. Thanks for your comment. I’m always happy to receive them, good or bad. However, I must disagree with you, if you’ll permit. The entire point of this particular blog post was to demonstrate, from an engineering point of view, how the design of these particular tuners is weak and prone to failure. They are not obviously defective from day one, but rather their design weakness becomes apparent after stresses are applied in a particular direction. These are stresses that a tuner should reasonably be able to deal with. It has even occurred to me that Gibson Deluxe Tuners might be designed specifically to fail, rather than transfer any knocks to the peghead, possibly causing a neck break (which, of course, Les Pauls are also susceptible to). Gibson’s quality control, incidentally, is not infallible, as you seem to believe. Just look at the other comments posted above. I had a bent tuner on my Les Paul Classic & took it apart to straighten it in a vice (worked ok).After taking the back cover off I noticed the housing was stamped "Made in Japan" or maybe just "Japan". So are these tuners actually made by Gotoh ?